It’s time to go back in the water. With all of the carping that Jaws is culpable for the summer blockbuster, it’s often forgotten that this spectacle of the future is also a product of its time. Amity Island’s mayor (Murray Hamilton) protects profits over lives, tossing touristchum to a great white shark. “I wanted to make a movie that left its mark, not at the box office but on people’s consciousness,” said Spielberg, and it should not be forgotten that he refused Universal’s suggestions of stars Charlton Heston and Jan-Michael Vincent for his leads, fearing they would “corrupt” verisimilitude. He also insisted on an open-sea shoot, his three mechanical sharks then exhibiting an aversion to salt water that saw the production balloon from 55 to 159 days, the budget from $3.5m to $7m. “My movie went from William Castle to Alfred Hitchcock,” smirked Spielberg, whose only option was to keep his moody monster beneath the ocean’s surface. Re-released into cinemas (Blu-ray to follow) with a digital scrub as part of Universal’s centenary celebrations – but not, thankfully, with any Lucas-like tweaks – Spielberg’s taut, sentiment free sophomore feature again presents itself as a great film full of great moments. 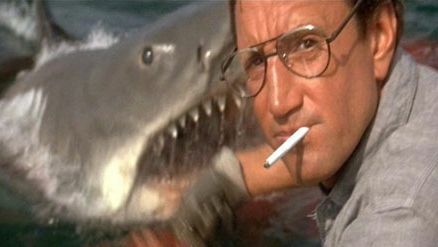 But most of all it’s the characters who float this boat, an unfinished script forcing Spielberg, Scheider, Richard Dreyfuss (as oceanographer Matt Hooper) and Robert Shaw (grizzled sea captain Quint) to improvise on set. From the buzzing island community to the three men and a very large lady, Jaws is a marvel of detailed, economical storytelling. Its heart and hope never spill over, its dread and darkness never depart. And while it might have been released into 409 theatres on the back of $700,000 of TV advertising to chomp a whopping $470m at the worldwide box office, it should never be held accountable for the likes of Transformers 2 , Sucker Punch and Immortals .